Many people ask me why I choose a particular composition for a painting. The inspiration is almost always based in what moves me at any given time in the year. An image or series of images must show contrast, fascinating planes of perspective, color variations and sometimes images have an emotional impact. I invite you to visit my gallery at: http://gerald-carpenter.pixels.com/ where you can see my completed works. My style remains realistic watercolor. 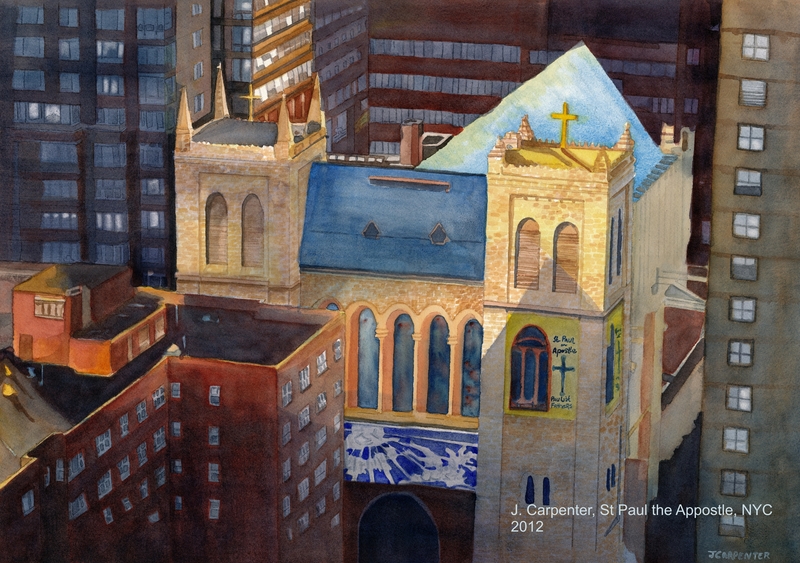 The painting I completed late last year of St. Paul of the Apostle Church in NY is one of those interesting stories. First off, it was the mother house of a priestly ordered that I was a member of for some years. It was a holy place for me and an island of peace in a concrete and glass jungle of NYC. The image was also an interesting perspective on the buildings with incredible contrast provided by shadows from the surrounding structures. Color was also important to balance in a highly detailed composition. I had to face some challenges: paint it realistically or lose, deal with shapes verses the details in all the various structures, Communicate the solemnity of the location, and to provide a focal point of interest in all this material. In the end you will be judge as it whether I succeeded. Remember, this is all watercolor, built layer on layer to manage the shadow work and the contrast. I also like to concentrate only briefly on subject matter and will often do a series of paintings in a particular style. Recently inspired by a fellow artist I undertook another architectural painting of part of NYC. The painting is known as ‘Solitary’. It is inspired by my experiences in NYC and wondering what it would be like to be the only one there. Painted in this unique style, I wanted to communicate the residual energy of movement, the power of sunlight on the buildings and yet the rather sterile looking environment of the local structures. This is a fun process to paint. Each brush stroke was laid down purposely and not loosely. 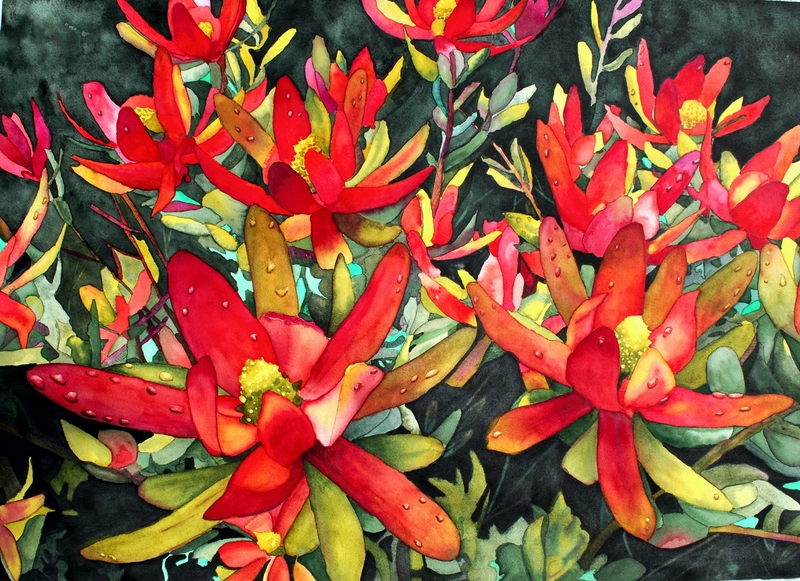 Each color was carefully chosen and then layered careful to create the scene. 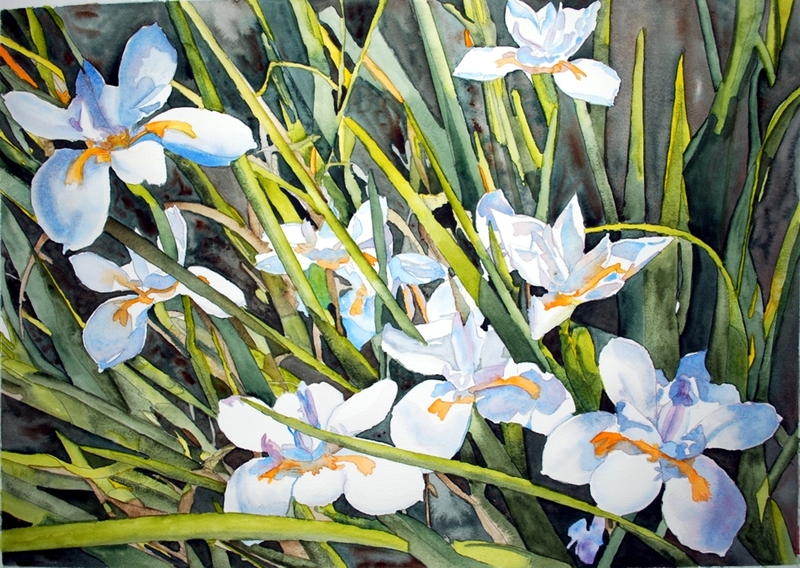 I have a new work in progress; Japanese Iris’ inspired by a walk around my workplace when I saw them hit by the sun. 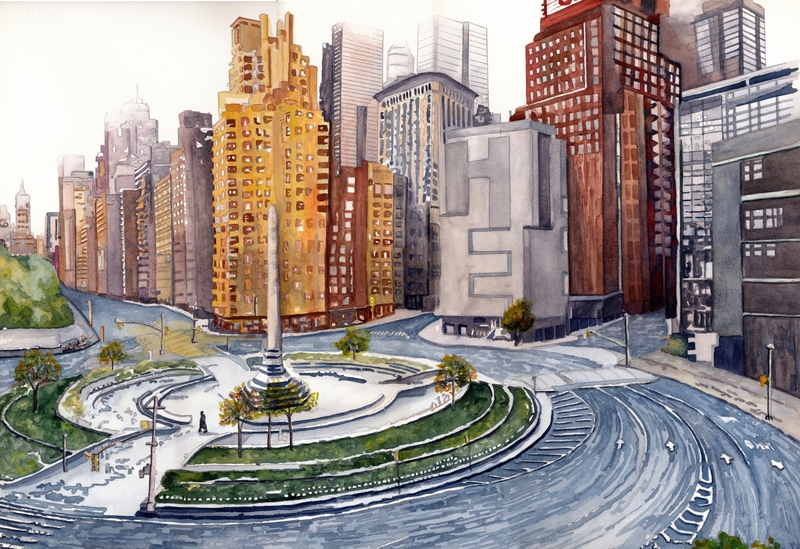 I love your watercolors, especially Columbus Circle in NYC. 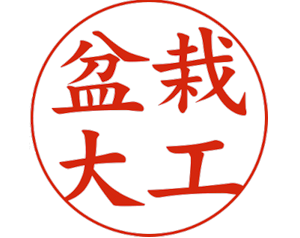 Thanks so much for visiting my site. The NYC painting was a work of love. It is a full sheet painting and took about 5 months to finish. I am glad you enjoyed it.